This page contains news and information about Highway US 62 in Kentucky. KentuckyRoads.com: Roads of the Land Between the Lakes - Includes US 62's crossing of Kentucky Dam. 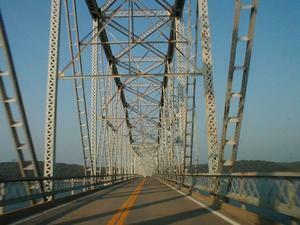 KentuckyRoads.com: William H. Harsha Bridge - Includes US 62's crossing of the Ohio River near Maysville. KentuckyRoads.com: Bridges of the Ohio River - Includes US 62's crossing of the Ohio River near Wickliffe. Illinois Highway Ends: US 62 - Information about US 62 in Illinois. FLEMINGSBURG, Ky. (August 7, 2015) – Traffic patterns returned to normal today along US 62 at Maysville, the city’s primary downtown access route, as contractors finished the bulk of a $4.4 million Kentucky Transportation Cabinet upgrade of the four-lane state highway. The upgrade rebuilt 1.2 miles of US 62 from the ground up, removing aging sub-surface concrete and repaving with nearly 14 inches of new asphalt to provide a smoother, more stable driving surface from the AA Highway to Moody Drive and on a shorter section from Fourth Street to Forest Avenue. ELIZABETHTOWN, Ky. (Aug 18, 2010) — Repairs to the Kentucky Railway Museum’s rail crossing on U.S. 62 at Boston, in Nelson County, will require closure of the highway beginning Monday, Aug. 30. The road will be closed through Wednesday, Sept. 1. 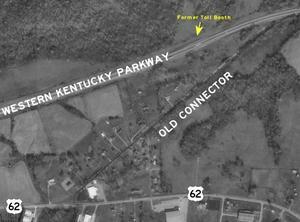 A contractor for the Kentucky Transportation Cabinet plans to restrict traffic to one lane on the US 62 Green River Bridge at Rockport starting Monday, September 28, 2009. GILBERTSVILLE, Ky. — A contractor for the U.S. Army Corps of Engineers plans to temporarily close US 62 and US 641 across Kentucky Dam starting Wednesday, September 9th, 2009, to begin preliminary road work required to tie in a new Tennessee River Bridge being constructed below the dam. Chunks of concrete have been found to be falling from Paducah’s Puryear Bridge. The bridge opened in 1997. The US 62 Tyrone Bridge was closed earlier this week in order to allow repairs to be made to its deck. In late September, the Simon Kenton Memorial Bridges was rededicated following a multiyear rehabilitation project. The bridge was originally dedicated Nov. 25, 1931. In addition to numerous local and state officials, two women who participated at the original dedication ceremony were on hand. On April 1, the Simon Kenton suspension bridge over the Ohio River at Maysville closed to traffic. This is part of the second year of a two-year project to refurbish the bridge. The bridge will reopen later this year. Travelers should use the new William H. Harsha Bridge a few miles downstream from the Kenton Bridge. Original construction of the bridge took only one year. It opened to traffic in 1931. The Buffalo Trade Area Development District has recently developed a list of top ten highway projects they would like to see added the Six Year Highway plan. The list includes widening several sections of KY 9, KY 10, and the AA Highway and reconstruction of several other area routes. The Simon Kenton Memorial Bridge over the Ohio River at Maysville will close this summer for repair work. The bridge was closed last summer as part of the same repair project, but has been open over the past winter. The bridge will close April 1 and is planned to reopen August 31. Prior to the completion of the westernmost 10 miles of the Western Kentucky Parkway, it ended at US 62 just west of Princeton. Once the parkway was completed, a short two lane segment of the parkway as abandoned. This Old Connector Road eventually became a residential street; however, several features clearly indicate it was once part of a major highway. Several photographs of the connector have been added to the Western Kentucky Parkway photo gallery. The Kentucky Standard reports that three spots along US 31E in Nelson County are receiving attention due to a high accident rate: High Grove, Gobel Lake Curve and Hibbs Lane accounted for more than 60% of the accident reported along that US 31E north of Bardstown. US 31E through the area is a two-lane road that is much the same as it was originally constructed back in the 1920s. The Transportation Cabinet plans to reconstruct part of the road between Nazerth and the Salt River; however, construction has been delayed due to historic sites along the route. Construction on the $100 million project is slated to begin in 2008. One site on US 62 in Nelson County was also noted for a high accident rate.Dump Hill. The Kentucky Transportation and Tourism Interagency Committee recently approved a scenic byway through Daviess, Hancock, Ohio, Muhlenberg, McLean, Webster, Union and Henderson counties that will highlight the region.s music heritage. Contracts will be let this month for another phase of the Leitchfield Bypass (KY 3155). This phase will connect the existing road at City Park to Salt River Road (KY 920) where it will tie in with the nearly complete northern phase of the bypass between Salt River Road and KY 259. Work is expected to begin as soon as weather permits. The US Army Corps of Engineers is in the process of building a new rail and highway bridge over the Tennessee River just below Kentucky Dam. The bridge is part of a project to build a large navigation lock at Kentucky Dam. The total cost of the project is expected to be $650,000,000. The 1200-foot bridge is expected to open in 2006; lock construction should be completed in 2012. The bridge will carry US 62 and US 641. Both routes currently cross the river via a road on top of the dam. A new connector route between US 62 and KY 33 had opened. The new by-pass route will divert truck traffic from Versailles's downtown streets. The Kroger grocery in Maysville has a replica of the Simon Kenton Memorial Bridge located near the produce section and photographs of the construction of the bridge near the entrance to the store. The Simon Kenton Memorial Bridge is a suspension bridge over the Ohio River. It was constructed in the 1930s and carries Business US 62 and Business US 68 into Ohio. I have added a new image gallery consisting of photographs I took of the roads of the Land Between the Lakes. Subjects covered include the US 68/KY 80 bridges over the two lakes, the KY 453 bridge over the Between the Rivers Canal, and road over Kentucky Lake. 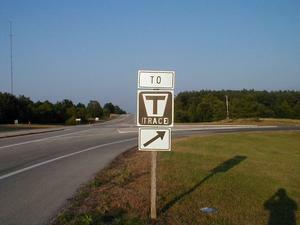 The exit from US 68/KY 80 to The Trace. Crossing the US 68/KY 80 bridge over Kentucky Lake. One route begins at Old Mayfield Road and I-24 in McCracken County and passes through the southern park of McCracken and Ballard Counties before crossing the Mississippi River at Wickliffe. Another route generally follows US 62 and KY 286 from Paducah to a new Mississippi River crossing at Wickliffe. A third route would follow I-24 into Illinois and construct a new route to Cape Girardeau, MO. Illinois officials are not participating in the study because of issues with building a route through the Shawnee National Forest. The engineering firm of Parsons Brinckerhoff Quade & Douglas is conducting the study along with the Kentucky Transportation Cabinet. Another meeting is expected to be held later this year. The Glasgow Daily Times reports that I-66 public meeting in Warren County and Edmonson County were well attended. They report that the engineering firm of Bernard, Lochmueller and Associates, Inc. is working with the Kentucky Transportation Cabinet to provide alternatives for routes the proposed I-66 between the Louie B. Nunn Cumberland Parkway and the William H. Natcher Parkway. Parties interested in viewing information from the public meetings should contact Keirsten Jaggers or Jeff Moore at the KYTC office in Bowling Green. The phone number is (270) 746-7898.